As our travels take us deeper into rural Texas we discovered the wonderful little town of Brady, Texas, population 5,500. 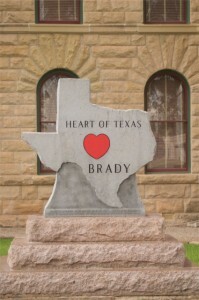 The county seat of McCulloch County, Brady is known as the heart of Texas for it’s location at the geographical center of the state of Texas. Almost. And the reason for that is that the true geographical point, when you have divided the state of Texas into four equal quadrants, is located just North of Brady, Texas off US Highway 377. If you would like to drive out to the roadside park 2 miles South of the town of Mercury, Texas a historical marker notes the spot and advises of the approximate location. McCulloch County where Brady, Texas is located has 27 historical markers. The Chamber of Commerce Office, located at 101 E. First St. in Brady, Texas has the complete list of all of the historical markers. Brady, Texas is the only place in Texas where five major highways meet. Chances are one may head from your hometown, whether it is Dallas/Fort Worth at 180 miles distant, San Antonio at 140 miles, Austin at 130 miles or Abilene at 110 miles, the road may lead to Brady, Texas! This entry was posted in Texas, Things to do in Texas and tagged Brady Texas, Heart of Texas, McCulloch County, small town America, Texas off the beaten path, Texas rural towns. Bookmark the permalink.